This is a list of paintings produced by members of the Pre-Raphaelite Brotherhood and other artists associated with the Pre-Raphaelite style. The term "Pre-Raphaelite" is used here in a loose and inclusive fashion. Self-portrait at the Age of 14, (1841), Ashmolean Museum, Oxford. F. G. Stephens (1847), Tate Britain, London. Christ and the Two Marys aka The Risen Christ with the Two Marys in the Garden Of Joseph of Aramathea (1847 and 1897), Art Gallery of South Australia, Adelaide. Rienzi vowing to obtain justice for the death of his young brother, slain in a skirmish between the Colonna and the Orsini factions (1848–49), collection Mrs. E. M. Clarke. The Haunted Manor (1849), Tate Britain, London. Cornfield at Ewell (1849), Tate Britain, London. A Converted British Family Sheltering a Christian Missionary from the Persecution of the Druids (1849–50), Ashmolean Museum, Oxford. Claudio and Isabella (1850–1853), Tate Britain, London. The Hireling Shepherd (1851), Manchester Art Gallery. The Awakening Conscience (1851–1853), Tate Britain, London. Our English Coasts (1852), Tate Britain, London. The Light of the World (1853-54), Keble College, Oxford. The Finding of the Saviour in the Temple (1854–1860), Birmingham Museum & Art Gallery. The Afterglow in Egypt (1854–63), Ashmolean Museum, Oxford. The Scapegoat (1854–1856), Lady Lever Art Gallery, Port Sunlight. The School-girl's Hymn (1858–59), Ashmolean Museum, Oxford. London Bridge on the Night of the Marriage of the Prince and Princess of Wales (1863-64), Ashmolean Museum, Oxford. The Festival of St. Swithin (The Dovecot) (1865–66), Ashmolean Museum, Oxford. Il Dolce Far Niente (1866), Forbes Magazine Collection. The Shadow of Death (1870–1873), Manchester Art Gallery. The Plain of Esdralon from the Heights above Nazareth (1877), Ashmolean Museum, Oxford. The Triumph of the Innocents (1883–84), Tate Britain, London. May Morning on Magdalen Tower (1888–1891), Lady Lever Art Gallery, Port Sunlight. The School of Nature (1893), Ponce Museum of Art, Puerto Rico. Christ the Pilot (ca. 1894). The Light of the World (with Edward Robert Hughes) (1900-1904), St.Paul's Cathedral, London. John Hunt, Tate Britain, London. John Key , Tate Britain, London. Cymon and Iphigenia (1847–48), Lady Lever Art Gallery, Liverpool. The Death of Romeo and Juliet (c.1848), Manchester City Art Gallery. Isabella (1848–49), Walker Art Gallery, Liverpool. Ferdinand Lured by Ariel (1850), Sudley House, Liverpool. Christ In The House Of His Parents (1850), Tate Britain, London. The Return of the Dove to the Ark (1851), Ashmolean Museum, Oxford. A Huguenot (1852), Makins Collection (private). Ophelia (1852), Tate Britain, London. The Proscribed Royalist, 1651 (1853), Andrew Lloyd Webber Collection. The Order of Release (1853), Tate Britain, London. Portrait of Annie Miller (1854) Private Collection. The Violet's Message (1854), Private Collection. Wandering Thoughts (1855), Manchester City Art Gallery. The Rescue (1855), National Gallery of Victoria, Melbourne. Peace Concluded (1856), Minneapolis Institute of Arts. Autumn Leaves (1856), Manchester City Art Gallery. The Blind Girl (1856), Birmingham Museum & Art Gallery. L'Enfant du Regiment (1856), Yale Center for British Art, Connecticut. A Dream of the Past: Sir Isumbras at the Ford (1857). The Escape of a Heretic (1857), Museo de Arte de Ponce, Puerto Rico. Only a Lock of Hair (1857–58), Manchester City Art Gallery. Spring (Apple Blossoms) (1859), Lady Lever Art Gallery, Liverpool. The Vale of Rest (1859), Tate Britain, London. The Black Brunswicker (1860), Lady Lever Art Gallery, Liverpool. The Ransom (1862), Getty Museum. The Eve of St. Agnes (1863), Royal Collection at Clarence House, London. Vanessa (1868), Sudley House, Liverpool. Stella (1868), Manchester City Art Gallery. The Boyhood of Raleigh (1870), Tate Gallery, London. A Flood (1870), Manchester City Art Gallery. Martyr of Solway (1871), Walker Art Gallery, Liverpool. The Somnambulist (1871), Bolton Museum and Archive Services, Bolton, Greater Manchester. Victory O Lord! (1871), Manchester City Art Gallery. Winter Fuel (1873), Manchester City Art Gallery. The North-West Passage (1874), Tate Gallery, London. Mrs Leopold Reiss (1876), Manchester City Art Gallery. The Two Princes Edward and Richard in the Tower (1876), Royal Holloway Collection, University of London, Egham. James Fraser (1880), Manchester City Art Gallery. An Idyll of 1745 (1884), Lady Lever Art Gallery, Liverpool. Bubbles (1886), owned by Unilever, on display at Lady Lever Art Gallery, Liverpool. The Nest (1887), Lady Lever Art Gallery, Liverpool. Dew-Drenched Furze (1890), Private Collection. Lingering Autumn (1890), Lady Lever Art Gallery, Liverpool. Glen Birnam (1891), Manchester City Art Gallery. See List of paintings by Dante Gabriel Rossetti. Ecce Ancilla Domini or The Annunciation (1850), Tate Britain, London. Paolo and Francesca da Rimini (1855), Tate Britain, London. Dante's Dream on the Day of the Death of Beatrice: 9th of June, 1290 or Dante's Dream at the Time of the Death of Beatrice (1856), Tate Britain, London. Bocca Baciata (1860), Museum of Fine Arts, Boston. Beata Beatrix (1864), Tate Britain, London. The Beloved or The Bride or The King's Daughter (1865–66, 1873), Tate Britain, London. Monna Vanna or Belcolore (1866), Tate Britain, London. Sibylla Palmifera or Venus Palmifera (1866–70), Lady Lever Art Gallery, Port Sunlight. Lady Lilith (1867), Metropolitan Museum of Art, New York. Pia de' Tolomei (c.1868), Spencer Museum of Art, Kansas. Silence (1870), Brooklyn Museum of Art, New York. The Bower Meadow (1872), Manchester Art Gallery. La Ghirlandata (1873), Guildhall Art Gallery, London. Proserpine (1874), Tate Britain, London. Damsel of the Sanct Grael (1874), collection of Andrew Lloyd Webber. Roman Widow or Dîs Manibus (1874), Museo de Arte de Ponce, Puerto Rico. Astarte Syriaca or Venus Astarte (1876–77), Manchester Art Gallery. A Sea–Spell (1877), Fogg Museum of Art, Harvard University. A Vision of Fiammetta (1878), Collection of Lord Lloyd-Webber. The Day Dream or Monna Primavera (1880), Victoria and Albert Museum, London. The Blessed Damozel (1875-1881), Lady Lever Art Gallery, Port Sunlight. Proserpine (1882), Birmingham Museums & Art Gallery, Birmingham. See main article Lawrence Alma-Tadema for a list of works. See List of paintings by Ford Madox Brown. Manfred on the Jungfrau (1840–61), Manchester Art Gallery. Take your Son, Sir! (1851–92, unfinished), Tate Britain, London. The Last of England (1855), Birmingham Museum & Art Gallery.. A further oil version (1860) is in the Fitzwilliam Museum in Cambridge  and a watercolour (1864-5) in Tate Britain, London. Stages of Cruelty (1856–1890), Manchester Art Gallery. 1856 watercolour sketch is in Tate Britain, London. Cromwell on his Farm (1873-74), Lady Lever Art Gallery, Liverpool. Cromwell, Protector of the Vaudois (1877), Manchester Art Gallery. See List of paintings by Edward Burne-Jones. The Merciful Knight (1863), Birmingham Museum & Art Gallery, Birmingham. The Beguiling of Merlin (1872–1877), Lady Lever Art Gallery, Port Sunlight. The Golden Stairs (1880), Tate Britain, London. 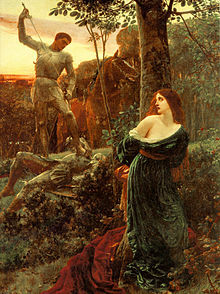 The Last Sleep of Arthur in Avalon (1881), Museo de Arte de Ponce, Puerto Rico. The Mill (1882), Victoria and Albert Museum, London. Georgiana Burne-Jones (1883), private collection (?). King Cophetua and the Beggar Maid (painting) (1884), Tate Britain, London. The Garden of Pan (c.1886), National Gallery of Victoria, Melbourne. The Star of Bethlehem (1887–91), Birmingham Museum & Art Gallery, Birmingham. The Nativity (1888), Carnegie Museum of Art, Pittsburgh. Hope (1896), Museum of Fine Arts, Boston. Autumn in the Welsh Hills (1860), Berger Collection Educational Trust, Denver Art Museum. At Binsey, near Oxford (1862), Cecil Higgins Art Gallery, Bedford. Sandpit near Abinger, Surrey, (1866–67), Walker Art Gallery, London. The Glacier of Rosenlaui (1856), Tate Britain, London. The Stonebreaker (1857–58), Walker Art Gallery, Liverpool. Florence from Bellosguardo (1863), Tate Britain, London. Lady with a Dove: Madame Loeser (1864), Tate Britain, London. The British Channel Seen from the Dorsetshire Cliffs (1871), Tate Britain, London. Rocks: Scilly (1873), Walker Art Gallery, Liverpool. Britannia's Realm (1880), Tate Britain, London. Trevose Head (1897), Walker Art Gallery, Liverpool. The Lollipop (1855), Tate Britain, London. Girl with Jug of Ale and Pipes (1856), Walker Art Gallery, Liverpool. The Dragon's Den (1854), Walker Art Gallery, Liverpool. Waiting for Legal Advice (1857), Walker Art Gallery, Liverpool. The Wife's Remonstrance (1857–58), Birmingham Museum & Art Gallery. News from My Lad (1859), Walker Art Gallery, Liverpool. Last Voyage Of Henry Hudson (1881), Tate Britain, London. Clytemnestra after the Murder (1882), Guildhall Art Gallery, London. Lilith (1887) Atkinson Art Gallery and Library, Southport. Priestess of Delphi (1891) Art Gallery of South Australia, Adelaide, Australia. The Laboratory (1895), Private Collection. Lady Godiva (c. 1898), Herbert Art Gallery & Museum, Coventry. In the Venusberg (1901), version on canvas at the Atkinson Art Gallery and Library, Southport. Version on board in a private collection. Mrs Huxley (1927–28), Tate Britain, London. Hale, Lancashire (c.1860), Walker Art Gallery, Liverpool. View from Bidston Hill (c.1865), Walker Art Gallery, Liverpool. A Day's Sport at Bidston Hill (c.1865), Tate Britain, London. See main article Thomas Cooper Gotch for a list of works. See main article Edward Robert Hughes for a list of works. See main article: John William Inchbold for a list of works. Going to Market (1860), Walker Art Gallery, Liverpool. Sweethearts and Wives (1860), Walker Art Gallery, Liverpool. 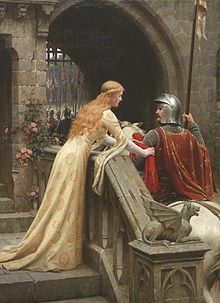 See main article Edmund Leighton for a list of works. See main article Frederic Leighton, 1st Baron Leighton for a list of works. See main article Evelyn De Morgan for a list of works. Mrs Sandys, the artist's mother (late 1840s), Fitzwilliam Museum, Cambridge. Self-Portrait in a broad-brimmed Hat (1848), Private Collection. Study of Miss Sandys (1849), Private Collection. Portrait of a Young Man (before 1850), Fitzwilliam Museum, Cambridge. Emma Sandys, the artist's sister (1853–1855), Fitzwilliam Museum, Cambridge. Queen Eleanor (1858), National Museum of Wales. Mary Magdalene (1858–1860), Delaware Art Museum, Wilmington. Listed at Bridgeman Art Library. Portrait of Adelaide Mary, Mrs Philip Bedingfeld (1859), Norwich Castle Museum and Art Gallery. Portrait of Mrs Clabburn (1860), Norwich Castle Museum and Art Gallery. Autumn (1860–1862) Norwich Castle Museum and Art Gallery. Oriana (1861), Tate Britain, London. King Pelles' Daughter bearing the Sancgraal (1861), Private Collection. Mary Magdalene (1862), Norwich Castle Museum and Art Gallery. La Belle Isolde (1862), Private Collection. Mrs. Susanna Rose (1862), Cleveland Museum of Art. Viven (1863), Manchester Art Gallery. Morgan le Fay (1864), Birmingham Museum & Art Gallery. Portrait of Jane Lewis, born 19 January 1793 (1864), Private Collection. Gentle Spring (1865), Ashmolean Museum, Oxford. Grace Rose (1866), Yale Center for British Art. Helen of Troy (1867), Walker Art Gallery, Liverpool. Love's Shadow (1867), Private Collection. Medea (1868), Birmingham Museum & Art Gallery. The Coral Necklace (1871), Cleveland Museum of Art. Portrait of a woman with red hair, Private Collection. Darby, a Yorkshire Terrier, Private Collection. Berenice, Queen of Egypt, Leighton House Museum, London. Portrait of Philip Bedingfeld LL.D, JP (undated), Norwich Castle Museum and Art Gallery. In the Desert (1854), private collection. The Mountains of Moab (1854), Tate Britain, London. Jerusalem and the Valley of Jehoshaphat from the Hill of Evil Counsel (1854–55), Tate Britain, London. View on the Nile (1855), Tate Britain, London. Pyramids at Gizeh (1855), private collection. The Citadel of Cairo, private collection. See main article Marie Spartali Stillman for a list of works. See List of paintings by John William Waterhouse. The Unwelcome Companion: A Street Scene in Cairo (1873), Towneley Hall Art Gallery, Burnley. Sleep and his Half-brother Death (1874), private collection. The Favourites of the Emperor Honorius (1883), Art Gallery of South Australia, Adelaide. Consulting the Oracle (1884), Tate, London. Saint Eulalia (1885), Tate, London. Esther Kenworthy Waterhouse (c. 1885), Sheffield City Art Galleries, Sheffield. The Magic Circle (1886), Tate, London. 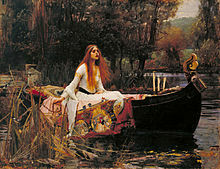 The Lady of Shalott (1888), Tate, London. Circe Offering the Cup to Ulysses (1891), Gallery Oldham, Oldham. Circe Invidiosa (1892), Art Gallery of South Australia, Adelaide. The Siren (c. 1900), private collection. The Crystal Ball (1902), private collection. Echo and Narcissus (1903), Walker Art Gallery, Liverpool. Jason and Medea (1907), private collection. Gather Ye Rosebuds While Ye May (1908), private collection. Gather Ye Rosebuds While Ye May (1909), Odon Wagner Gallery, Toronto. Circe (The Sorceress) (1911), private collection. I am Half-Sick of Shadows, said the Lady of Shalott (1916), Art Gallery of Ontario, Toronto. Dante and Beatrice (c.1915), Dahesh Museum, New York. Morecambe Bay from Warton Crag (1862), Walker Art Gallery, Liverpool. Coniston Old Man from Warton Crag (1863), Walker Art Gallery, Liverpool. A Grey Day (1865), Walker Art Gallery, Liverpool. The Black Boy (c.1844), Walker Art Gallery, Liverpool. Too Late (1858), Tate Britain, London. Study of a Dead Child, the Artist's Son (1860), Tate Britain, London. The Flight of Henry VI from Towton (c. 1860–1870), Tate Britain, London. The Outlaw (1861), Manchester Art Gallery. The Second Duchess (before 1866), Tate Britain, London. Mrs Teed, the Artist's Daughter (c.1880), Tate Britain, London. Samuel Teed (date unknown), Manchester Art Gallery. Wikimedia Commons has media related to Pre-Raphaelite Brotherhood. ^ "The Pre-Raphaelites at National Museums Liverpool, Liverpool museums". Liverpoolmuseums.org.uk. Retrieved 15 November 2013. ^ "Christ in the House of His Parents ('The Carpenter's Shop'), Sir John Everett Millais, Bt". Tate. Retrieved 15 November 2013. ^ "The Return of the Dove to the Ark (work by Millais) - Encyclopædia Britannica". Britannica.com. Retrieved 15 November 2013. ^ "Millais' A Huguenot from The Makins Collection :: ArtMagick Exhibition Listings". artmagick.com. Retrieved 15 November 2013. ^ "Ophelia, Sir John Everett Millais, Bt". Tate. Retrieved 15 November 2013. ^ "Sir John Everett Millais, The Proscribed Royalist 1651, 1853 | guardian.co.uk Arts". Arts.guardian.co.uk. Retrieved 15 November 2013. ^ "The Order of Release 1746, Sir John Everett Millais, Bt". Tate. Retrieved 15 November 2013. ^ "Manchester City Galleries - Search the collection". Manchestergalleries.org. 7 July 2006. Retrieved 15 November 2013. ^ "Minneapolis Institute of Arts - The Collection". Artsmia.org. Archived from the original on 10 May 2013. Retrieved 15 November 2013. ^ Severn Internet Services - www.severninternet.co.uk. "Oil Painting - The Blind Girl - Birmingham Museums & Art Gallery Information Centre". Bmagic.org.uk. Retrieved 15 November 2013. ^ "Sir John Everett Millais (1829-1898)". Batguano.com. Retrieved 15 November 2013. ^ "The Vale of Rest, Sir John Everett Millais, Bt". Tate. Retrieved 15 November 2013. ^ In the study of Queen Elizabeth The Queen Mother, as attested by sculptor John Robinson in his autobiography, "From the Beginning Onwards--The Autobiography of John Robinson" (PDF). p. 365. ^ "The Boyhood of Raleigh, Sir John Everett Millais, Bt". Tate. Retrieved 15 November 2013. ^ "The North-West Passage, Sir John Everett Millais, Bt". Tate. Retrieved 15 November 2013. ^ "Millais: Chill October". Artchive.com. Retrieved 15 November 2013. ^ "Artwork highlights - Bubbles, by Sir John Everett Millais". Liverpoolmuseums.org.uk. Retrieved 15 November 2013. ^ "Sir John Everett Millais. Dew-Drenched Furze - Olga's Gallery". Abcgallery.com. Retrieved 15 November 2013. ^ "The Last Voyage of Henry Hudson, The Hon. John Collier". Tate. Retrieved 15 November 2013. ^ "atkinsongallery.co.uk". atkinsongallery.co.uk. Retrieved 15 November 2013. ^ a b c d e f g h i j k l "bridgeman.co.uk". bridgeman.co.uk. Archived from the original on 22 August 2013. Retrieved 2013-11-15. ^ "Mrs Huxley, The Hon. John Collier". Tate. Retrieved 15 November 2013. ^ "Fitzwilliam Museum - OPAC Record". Fitzmuseum.cam.ac.uk. Archived from the original on 10 June 2015. Retrieved 2013-11-15. ^ "Fitzwilliam Museum - OPAC Record". Fitzmuseum.cam.ac.uk. Archived from the original on 5 February 2012. Retrieved 2013-11-15. ^ "Art Collections Online | National Museum Wales". Museumwales.ac.uk. Retrieved 15 November 2013. ^ "Norwich Castle Museum and Art Gallery Sandys Collections". Sandys.norfolk.gov.uk. 26 February 1942. Retrieved 15 November 2013. ^ "Norwich Castle Museum and Art Gallery Sandys Collections". Sandys.norfolk.gov.uk. Retrieved 15 November 2013. ^ "Oriana, Frederick Sandys". Tate. Retrieved 15 November 2013. ^ Severn Internet Services - www.severninternet.co.uk. "Oil Painting - Morgan-le-Fay - Birmingham Museums & Art Gallery Information Centre". Bmagic.org.uk. Retrieved 15 November 2013. ^ Severn Internet Services - www.severninternet.co.uk. "Oil Painting - Medea - Birmingham Museums & Art Gallery Information Centre". Bmagic.org.uk. Retrieved 15 November 2013. ^ "Norwich Castle Museum and Art Gallery Sandys Collections". Sandys.norfolk.gov.uk. 26 January 1942. Retrieved 15 November 2013. ^ "The Mountains of Moab, Thomas Seddon". Tate. Retrieved 15 November 2013. ^ "Jerusalem and the Valley of Jehoshaphat from the Hill of Evil Counsel, Thomas Seddon". Tate. Retrieved 15 November 2013.